/ Home / Press office / PR opinion / All smiles for the sugar tax! There are two facts about children’s oral and general health that always pull people up short. The first is that around 25,000 children a year are admitted to hospital to have teeth removed under anaesthetic – a situation which, with a better understanding of diet and oral hygiene and care, is almost completely avoidable. The second is that, according to Public Health England, the average five-year-old in England consumes their body weight in sugar in a year. Unsurprisingly, there is an inarguable link between these two statistics, which is why the dental profession has welcomed the news of a levy on sugary drinks with open arms. Hidden sugars in food and drink a real culprits here, which is why we are pleased that the tax on sugary drinks will be introduced after all. Not only will this incentivise soft drink manufacturers to greatly reduce the amount of sugar in their products, but where they do not make the necessary reductions it is likely that they will pass the extra costs on to their customers – hopefully making sugary drinks expensive enough for parents to think twice about buying them for their children. At Plymouth University Peninsula School of Dentistry, children’s oral health is high on our agenda. We run special children’s clinics in our Dental Education Facilities, where our students treat NHS patients under the supervision of qualified dental health professionals. Children’s appointments are about more than check-ups and treatment – they also include support, advice and information for children and their families about how to look after their teeth and maintain a healthy diet, including how to reduce sugar intake. Via the Peninsula Dental Social Enterprise we also go out into the community to spread the message. 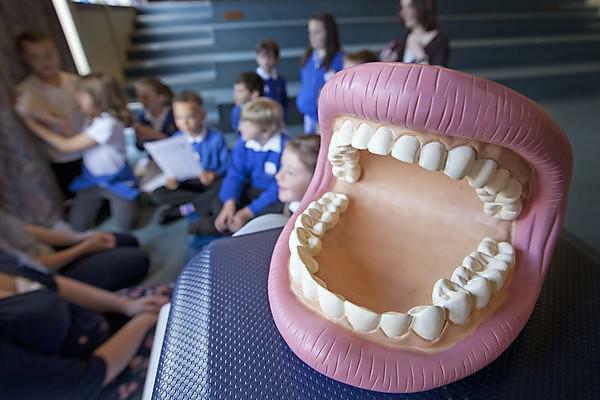 Students run oral health awareness sessions with a wide variety of groups in the community – including schools and nurseries – as part of their studies and the Community Engagement Team at Peninsula Dental Social Enterprise are also active. We also carry out research specifically aimed at children’s teeth – both in the community and the lab. We received a grant from the Medical Research Council to investigate the effectiveness of embedding a dental nurse in the Family Nurse Partnership Programme. The Programme supports and advises young mothers and we believe that including a dental nurse as part of its offering will help to improve children’s oral health. We have also carried out research to evaluate Brush DJ, a free app which encourages youngsters to brush their teeth for two minutes twice a day. The research showed that 70 per cent said their teeth felt cleaner since using the app and 88 per cent said that it had motivated them to brush their teeth for longer. Elsewhere, my colleague Professor Elizabeth Kay has played a vital role in the development of NICE guidelines around children’s oral health care, especially in encouraging local authorities, schools and nurseries to support children, parents and carers. In the laboratory, we found that local anaesthetic may affect the growth of children’s teeth. This is worrying, because a proportion of those 25,000 children I mentioned at the start of this article may receive local anaesthetic for their treatment. Another compelling reason to protect our children’s teeth so that they do not require extractions. So, what should children and their parents do to improve oral health? Limit the amount of sugary and acidic foods and drinks kids consume. These will harm teeth and frequent snacking may make your children less hungry when it’s meal time. Between meals try tooth friendly snacks like cheese, fruit and vegetable sticks, breadsticks, marmite or butter on toast, rice cakes, or a bowl of non-sugary cereal with milk. Limit dried fruit as it is high in sugar and can stick to children’s teeth, and never allow sugary foods or drinks just before bed; drink only water at night. Keep sweets, cakes, fizzy drinks and other 'treats' for pudding or as part of a meal. Help children to brush their teeth for two minutes twice a day. Always last thing at night and then at one other time during the day (lots of people choose first thing in the morning – this should be before breakfast). Use a fluoride toothpaste, a small amount about the size of a pea. Children over three years old should use a toothpaste with a fluoride level of 1350ppm to 1500ppm (parts per million). This will be printed on both the box and the tube. Use a toothbrush with a small head. This will help you to clean the back teeth and in all the tiny spaces. Spit, don’t rinse, and brush teeth in a special order so you don’t miss any: and make sure you get all five surfaces of each tooth (biting/chewing surface, front, back, inside and outside). Be gentle and use circular or tiny side to side movements. Brush the gums where they meet the teeth gently using the same circular or tiny side to side movement. Replace a child’s toothbrush regularly. A three-month old toothbrush is 30 per cent less effective at removing plaque than a new one. If using a powered toothbrush make sure it is charged or change the batteries regularly so the brush remains effective. We recommend that you help your children brush their teeth until they are at least seven years old. We welcome the tax on sugary drinks and it will go a long way to improving the oral health of our children. But it will not achieve this alone – it is up to us to take responsibility for our children’s teeth, so that they develop without decay and go on to last them a life time.